Even the best laid diet plans often go out the window during the festive period as people munch on Christmas puddings, have a few too many mince pies, use a sweet tooth as an excuse for eating too many of the children’s sweets and wash it all down with lots of alcohol, but a trip to the Fruit Shop will keep your diet on track and ensure that you get your five-a-day! 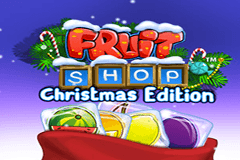 Software by Net Entertainment (NetEnt) powers the Fruit Shop Christmas Edition video slot which is a sequel to the original Fruit Shop slot, however those of you who played it and were hoping for even more bonus games will be left as disappointed as a child who didn’t get the top item on their Christmas list as it is essentially the exact same online slot with revamped graphics for the festive period. The festive Fruit Shop display is sure to get you in the mood for Santa coming as it boasts a beautifully decorated Christmas tree to the right of the reels and a very impressive snowman stands to the right of them. Once again, you’ll be spinning 5 reels over 15 fixed win lines and while you can play for free below with no download needed, those of you who prefer to play for real cash can do so from 15p up to a maximum of £150. While it’s not packed with features, trigger the fruity free spins feature and you’re in for a Christmas to remember for years to come! The Fruit Shop ensures that you get your fruit fix over the festive period and you’ll be hoping to get your five-a-day as that will mean very tasty wins. However, those of you who have played the original Fruit Shop slot will be pretty disappointed to learn that the exact same symbols have been used by NetEnt with the only difference being that these ones have a frosty overlay. Top of the tree on this pay table is the Fruit Shop logo which acts as the Wild symbol with the special ability to substitute for all other symbols and whenever it is part of winning combinations the are doubled in value. Five delicious fruits feature on the reels too with cherries providing tasty wins of up to 2,000 coins, plums seeing you sink your teeth into wins worth up to 1,000 coins, zesty lemons leave a sweet aftertaste as you enjoy up to 750 coins, oranges offer satisfying wins of up to 500 coins and juicy watermelons see you claim up to 200 coins. NetEnt have also included Ace to 10 symbols as the lowest-paying symbols on the pay table and these have been designed with a frosty twist as icicles hang from them. Hearing the jingle of bells means you have landed a fruity winning combination and you’re set to have a jolly good time spinning the reels for free! Just like the original, there is an array of different combinations which see you trigger the free spins feature in this free Fruit Shop Christmas Edition slots game. Either two or three cherries will see you receive 1 free spins, four of them earn you 2 free spins while five of them see you claim 5 free spins. You will also be gifted free spins by matching three or more of the other four fruit symbols with three of them earning you 1 free spin, four bringing you 2 free spins and five of them see you unwrap 5 free spins. Just when you thought that was generous enough, the gifts just keep on coming in this game feature as all wins are subject to a 2x multiplier bonus and if you land the combinations outlined above during your free spins, that number of additional free spins will be added to your counter to keep the festive fun flowing well into the early hours! Players who have played the original Fruit Shop slot won’t be too impressed by this seasonal offering from NetEnt, however those of you who didn’t play it will have a merry old time spinning the reels and claiming your five-a-day – especially if you receive the gift of free spins! Other NetEnt slots are at the top of my list to play during the festive period each year with Flowers Christmas Edition and Secrets of Christmas being two of my favourites and I’d encourage you to give those a try too!